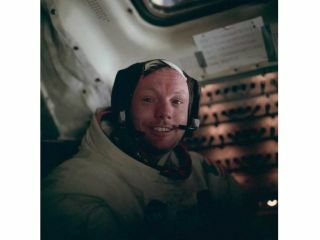 Neil Armstrong sits in the lunar module after a historic moonwalk. Armstrong was famously reticent about his accomplishments, preferring to focus on the team that helped him get to the moon rather than his own first steps. "I guess we all like to be recognized not for one piece of fireworks, but for the ledger of our daily work," Armstrong said in an interview on CBS's "60 Minutes" program in 2005, according to Reuters. In another interview, when asked what it feels like to have his footprints remain on the moon's surface for thousands of years, Armstrong said, "I kind of hope that somebody goes up there one of these days and cleans them up," Reuters added. An official biography of Armstrong was published in 2005, called "First Man: The Life of Neil A. Armstrong." It was written by James R. Hansen, a former NASA historian and later a history professor at Auburn University. Armstrong was born in Wapakoneta, Ohio, on Aug. 5, 1930. His parents were Stephen Koenig Armstrong and Viola Louise Engel. Armstrong was a naval aviator from 1949 to 1952 and served in the Korean War. Armstrong got a bachelor of science degree in aeronautical engineering from Purdue University in 1955; much later (after he became world-famous) he received a master of science in aerospace engineering from the University of Southern California in 1970. As a NASA test pilot, Armstrong flew the X-15, a rocket-powered, missile-shaped aircraft that tested the limits of high-altitude flight. He flew more than 200 different aircraft, from jets to gliders and even helicopters. In 1962, Armstrong was selected with NASA's second group of astronauts, who flew on the two-seat Gemini missions to test out space technology, and the three-seat Apollo missions that ultimately took 12 people to the surface of the moon. Armstrong's first flight was the command pilot of the Gemini 8 mission in March 1966, the sixth crewed mission of that series. The crew was not fully certain they would be the first on the moon; NASA had a tight sequence of missions happening every few months, and all mission objectives needed to be accomplished for each one to get Apollo 11 to the moon in time. Missions before Apollo 11 included the first crewed trip around the moon (Apollo 8, December 1968), the first test of the lunar module in space (Apollo 9, March 1969) and the first simulated lunar landing (Apollo 10, May 1969). However, the crewmembers were cognizant that their trip was planned to be the first landing, and designed their mission patch with that in mind. It featured an eagle holding an olive branch in its talons; the crew also left their names off of the mission patch to make the mission more representative of humans in general, according to Collins' book "Carrying the Fire" (1974). Apollo 11 lifted off from Florida's Cape Canaveral in sight of vast crowds of people who camped there to watch the launch on July 16, 1969. The crew journeyed to the moon for four days, achieved lunar orbit, and separated the two spacecraft on July 20. Armstrong took over the landing himself when he saw that the computer was guiding them to a boulder-filled landing zone. Landing was achieved at 4:14 p.m. EDT (2014 GMT) with only 25 seconds of fuel left. Armstrong announced, "Houston, Tranquility Base here. The Eagle has landed." Capsule communicator and astronaut Charles Duke responded from Earth: "Roger … Tranquility, we copy you on the ground. You got a bunch of guys about to turn blue. We're breathing again. Thanks a lot." Armstrong and Aldrin together explored the surface during a moonwalk that lasted 2 hours and 36 minutes. They collected 48.5 pounds (22 kilograms) of material from the surface —including 50 moon rocks — as well as deploying experiments, planting the U.S. flag and taking a moment to speak with then-U.S. president Richard Nixon. The Eagle's crew lifted off safely from the moon on July 21, docked with Columbia, and voyaged back to Earth for a successful ocean landing on July 24. The astronauts went into quarantine to mitigate the (unlikely) risk that they were carrying some sort of moon germs back with them, and then embarked on a world tour to celebrate the mission. After his time as an astronaut, Armstrong was deputy associate administrator for Aeronautics at NASA headquarters. He resigned from NASA in 1971. Subsequently, from 1971 to 1979, he was professor of aerospace engineering at the University of Cincinnati. From 1982 to 1992, Armstrong was chairman of Computing Technologies for Aviation, Inc., in Charlottesville, Va. Armstrong also participated in the Rogers Commission, which was a presidential commission tasked to look at the causes and events of the fatal Challenger shuttle explosion of Jan. 28, 1986, that killed seven astronauts. Armstrong chose to mostly stay out of the spotlight after leaving NASA, although he did reappear periodically for interviews or for anniversary events concerning Apollo 11. While his public statements were few, he did follow spaceflight news of his day and occasionally made comments on what was happening. He remained a vocal supporter of suborbital spaceflight. On the other hand, the former Apollo astronaut was publicly critical of plans to shift the crewed spaceflight from NASA to private spacecraft. On Aug. 7, 2012 —two days after Armstrong turned 82 years old — the famed moonwalker underwent coronary bypass surgery. Complications from that surgery resulted in his death Aug. 25. "Neil was our loving husband, father, grandfather, brother and friend," his family wrote on the website neilarmstronginfo.com. "For those who may ask what they can do to honor Neil, we have a simple request," they added. "Honor his example of service, accomplishment and modesty, and the next time you walk outside on a clear night and see the moon smiling down at you, think of Neil Armstrong and give him a wink." Tributes poured in from many public figures, including then-U.S. president Barack Obama, Republican presidential candidate Mitt Romney, then-NASA administrator Charles Bolden, Apollo 11 crewmates Aldrin and Collins, and various space representatives in the public, private and not-for-profit spheres. "Neil was among the greatest of American heroes — not just of his time, but of all time," Obama's statement read in part. "When he and his fellow crew members lifted off aboard Apollo 11 in 1969, they carried with them the aspirations of an entire nation. They set out to show the world that the American spirit can see beyond what seems unimaginable — that with enough drive and ingenuity, anything is possible." A private memorial service for Armstrong was held Aug. 31, 2012, at the Camargo Club in Cincinnati. ) Two weeks later, a publicly televised memorial service was held at the National Cathedral in Washington, D.C.
Armstrong was buried at sea Sept. 14, 2012, in a ceremony aboard the guided missile cruiser USS Philippine Sea. Armstrong's family was on board when the ship left port in Mayport, Fla., and released his ashes somewhere in the Atlantic Ocean. Obama ordered flags around the United States to fly at half-staff on the day of the funeral. In 2015, the Smithsonian Institution revealed that Armstrong had kept aside a cloth bag full of small parts from the lunar module Eagle, which lay undiscovered for decades until his widow Carol found it. While Armstrong made no mention of this bag in decades of interviews, the bag was discussed a few times during the mission itself. It is unknown how Armstrong ultimately gained possession in the bag, but it was common during the Apollo years for astronauts to retain souvenirs of their flights. (A month after Armstrong's death, Obama made legal a bill to allow Mercury, Gemini and Apollo astronauts to retain legal title to these mementos.) Former "Mythbusters" host Adam Savage subsequently created a carry bag based on the design of Armstrong's "purse"; the design was actually used in several Apollo missions before and after Apollo 11. The Columbia spacecraft was on display at the Smithsonian National Air and Space Museum in Washington, D.C., between 1976 and 2016 in the museum's main hall. Then, the famous spacecraft was removed for restoration at the Steven F. Udvar-Hazy Center in Virginia, the annex to museum. Meanwhile, the main hall was renovated and a new "Destination Moon" gallery began construction, with intentions to redisplay Columbia there when it re-opens. The spacecraft itself is currently on tour, reaching locations in Houston, St. Louis, Pittsburgh and Seattle. It will be at the Museum of Flight in Seattle for the 50th anniversary of the Apollo 11 mission in July 2019. In a 2013 BBC documentary, Armstrong's brother Dean said that he knew of the famous first words on the moon several months before Apollo 11 touched down. Dean reported that Armstrong passed him a handwritten note as the brothers played a late-night game of Risk, according to British newspaper the Telegraph. However, Dean's remarks contradicted many statements by Armstrong himself, who said that the words didn't come to him until he arrived on the moon. The other Apollo 11 astronauts have also backed up Armstrong's assertions. In 2017, a rare gold lunar model was stolen from the Armstrong Air and Space Museum in Wapakoneta, Ohio. "Entry to the museum was discovered and taken was a solid gold replica of the 1969 Lunar Excursion Module that landed on the moon," Russel Hunlock, Wapakoneta police chief, stated in a release. "The piece is very rare as it was presented to Neil Armstrong in Paris, France, shortly after the moon landing." A Neil Armstrong biography will come to theaters in 2018. The movie is based upon the James R. Hansen book "First Man: The Life of Neil A. Armstrong" and will star actor Ryan Gosling.